Low interest rates on mortgages are all considered the primary factors in the ever expanding world of ornamentals. In comparison with other types of American agriculture, the net farm income for nursery and greenhouse crops is considered one of the highest. The American Nursery and Landscape Association reports that on average greenhouse and nursery owners annual income of $53,589 is four times higher than the U.S. average ($13,458). 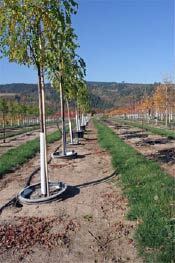 The Northwest states mirror the rise in interest on the national scene for high quality nursery stock. In Washington the nursery, greenhouse, and floriculture industry is ranked 7th in terms of value of production. 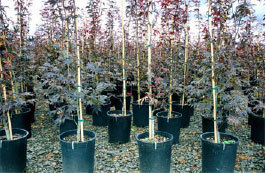 Over the period of 1994–2003 the total value of Washington’s nursery industry increased by 22%. In Oregon the nursery and greenhouse industry constitutes the leading agricultural commodity having seen a 100% increase in total value over the last 10 years. Nursery and greenhouse crops cash receipts as reported by the USDA Economic Research Service over the period of 1994-2003 in millions of dollars. Oregon’s top five producing nursery stock regions include Multnomah, Clackamas, Washington, Marion, and Yamhill counties. Comprising 86% of the total value of production these counties offer local employment and a plethora of beautiful plants for the regions homes, parks, and business establishments. 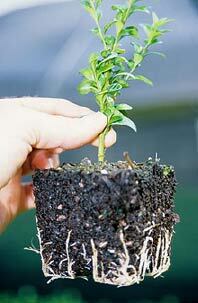 There are numerous alternative options for the production of ornamental nursery stock. Growers can utilize agricultural sites in which to raise in-ground plant material or turf, fairly level sites in which to raise above ground container stock, or greenhouses in which to raise herbaceous perennials, annuals, flowering gift plants and cut bulb flowers. Ornamental farm sizes extend from small, 1–2 acre greenhouse or container yard operations owned and operated by a single owner, up to many times larger operations involving many acres with extensive holdings of equipment, buildings, and labor. Smaller operations can be very lucrative especially when the owner sells a select species of plants in a retail environment. Specialty independents can compete very successfully with the chain stores by offering excellent customer service, greater selection, and better plant quality. In southwest Washington some of the most profitable ornamental garden centers are located on small retail pads located near to population centers. Larger operations typically grow stock for the wholesale trade and ship plant material extensively across the western States. The vast majority of consumers at retail garden centers would prefer to take home a woody ornamental in a plastic pot for the sake of convenience. Woody landscapes trees and shrubs can be raised both in the ground as well as in containers. In-ground stock is typically established on gently sloping ground, raised to a height of 4’–10’ and then harvested in the winter as either bare-root or as Balled and Burlapped stock. So called B & B stock retains a ball of soil around the root system, contained within either a burlap blanket or wire basket in order to keep the root system intact during shipment. B & B stock can only be shipped as dormant stock during the spring thus limiting the marketing options for producers. Garden centers don’t prefer B & B stock any longer. Consequently B & B producers have begun to put their stock into containers. 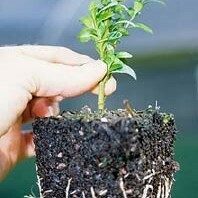 Once the plant has stabilized in the pot it is then sold to retailers. Landowners with smaller parcels are often attracted to herbaceous perennials as they can be produced in a short period of time (12–18 months), offer the potential for specialization, and return a much higher income potential than annual bedding plants. The sale of herbaceous perennials is becoming an ever more popular part of the burgeoning interest in Farmer’s Markets in the Pacific Northwest. The Perennial Plant Association can assist the new as well as established producer maximize the potential of the vast diversity of perennials. 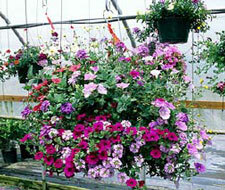 Greenhouse growers find that hanging baskets can be a lucrative item for sale to condominium and apartment owners. The production of lilies, tulips, daffodils, iris, and dahlias is prominent part of the Northwest’s nursery industry. All of these plants offer the potential for high returns per acre, a plethora of different cultivars, and veritable rainbow of colors from which to attract road-side shoppers. Landowners with parcels of well drained, nearly level sites will find a strong demand for both the cut flowers as well as the bulbs and tubers of these species. 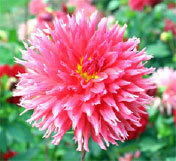 Selecting and viewing cut flowers such as dahlias are a popular consumer activity in the fall months. Nursery crop producers have formed a number of trade associations in the Northwest to help collectively market their crops and services. In Oregon the Oregon Association of Nurseries has published an on-line NurseryGuide listing all of it’s members as well as a listing of all the different plant species available. The OAN sponsors annual trade shows. For the commercial audience the FarWest Show is held at the end of August each year at the Portland Convention Center. This is the highest-attended nursery industry trade show in North America with over 14,000 visitors in 2004, stopping to talk with more than 870 exhibiters. For the consumer audience the OAN sponsors the annual Yard, Garden, and Patio Show in February each year. Over the 3 day run of this show more than 35,000 visitors can be expected to talk with more than 300 nursery and landscape exhibitors. In Washington the Washington Nursery and Landscape Association also hosts an on-line Buyers Guide, annual seminars for its membership, as well as sponsoring the Certified Professional Horticulturist certification program. In southwest Washington the Specialty Nursery Association of Clark County sponsors an annually published Specialty Nursery Guide listing all of its members and the plants they have for sell. The SNACC organization also helps sponsor the annual Home and Garden Idea Fair held at the Clark County Fairgrounds. The American Nursery and Landscape Association (ANLA), bases out of Washington D.C., represents the nation’s nursery members who grow, distribute, and retail plants of all types, and design and install landscapes for residential and commercial customers. ANLA provides education, research, public relations, and representation services to members. Currently there are 2,200 ANLA members across the United States. Presently the nursery and landscape industry is riding the crest of the home improvement wave that is sweeping across the country. As long as home ownership and improvement are key factors of wealth generation and personal satisfaction there should be continual strength in this industry. There is certainly a growing interest on the part of consumers for a larger diversity of plant cultivars and a desire for larger planting stock. There is waiting list for vender booth space at all of the home and garden as well as wholesale nursery shows in the Portland/Vancouver area. Privately owned firms that cater to local communities can capitalize on this interest by building specialty retail operations featuring a diversity of larger plant sizes in either plastic containers or tree boxes for the smaller stature garden trees.